We make films for fun, as a social record, to enter into competitions or to just improve techniques. So, if you want to make the most of that video you shot on holiday, or make a film from old family photos, why not come along and be part of the club's future film making. New members are guaranteed a warm welcome regardless of ability or experience. 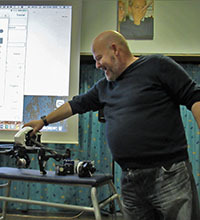 Dave Black made a return visit to us and brought the club upto date with the latest developments in aerial photography . . . . .